As for this corporation, it have a lot of results not only in domestic direction but also overseas through overall electrical machinery and appliances, via heavy electricity. Our products are being used till present time without any dissatisfaction in the subway streetcars of overseas locations, LRV, and the suburb's streetcars. Loading method is adding the floor suspension and equipment interior installation to customer's request from establishment on the roof as in the picture. When the conditions do not meet, we discuss it beforehand until a customer is consented to. 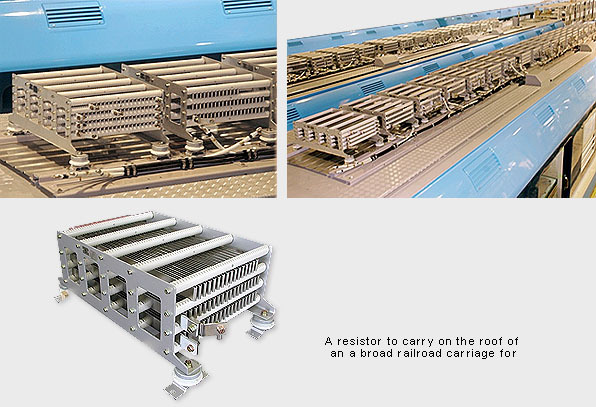 The photograph is one of the resistors for loading on the roof-shaped rolling stocks for overseas location railway. A train is used with formation by 4M4T (4 motor cars, with 4 trailers, a total of 8 cars for 1 formation). In addition to the main resistor, each resistor consists of 18 boxes with weak magnetic field and Circuit-interrrupting excitation.